Tuli has the largest privately-owned game conservation area in Southern Africa. Set in a landscape of unrivalled natural beauty, Tuli is known as “the land of giants” for its panoramic vistas, amazing topography, ancient baobab trees and rocky features carved from ancient granite and basalt rocks. Tuli Botswana offers particularly good wildlife sightings due to its abundance of animals and a profusion of birds. The lack of thick vegetation makes it easier to spot and capture the special moments for which Tuli is becoming renowned. 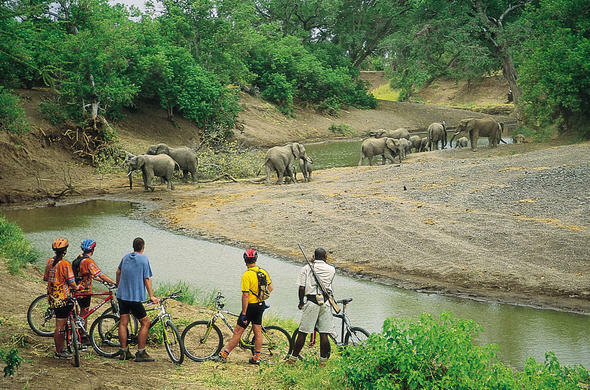 Cycling safari at Mashatu Reserve. A truly different take on the "safari" Journey with us to a place where ancient Africa still lives on and where the giants of Africa are dwarfed by the immensity of the wilderness itself dominates the senses and stirs the soul. A stay at one of the Tuli Safari Lodges gives you the opportunity to indulge in an unforgettable Botswana safari experience with a professional safari guide. Tuli is known for its amazing abundance of game, and wildlife sightings on your Tuli safari holiday are virtually guaranteed to be plentiful. The Tuli Block includes the Mashatu Game Reserve, Tuli Nature Reserve and other smaller game reserves creating a vast area for birdlife and a spectacular opportunity for birding enthusiasts to look forward to with some 350 species that occur in the region. In the wet summer months birding in Tuli Block is especially good and visitors can see a large number of newborn antelope. The landscape is lush and green at this time and many travelers are left in awe at the aesthetic beauty that this region has to offer. The Tuli area boasts vast skies and is an amazing region for star-gazing. Nights of clear skies offer enthusiasts a chance to see many constellations unhindered by civilization's light pollution. Stargazing in Tuli is truly an unforgettable experience. The Tuli region is home to one of Africa's most widespread cats, the Leopard. However these cats are seldom seen due to their solitary nature. The lack of vegetation in Tuli however increases the possibilities of seeing the leopards of Tuli in their natural habitat. Hyenas are commonly seen in the Tuli region. Hyena's social structure revolves around clans which are dominated by the largest female. In the darkness of tranquil African nights, their sounds of whooping and giggling can be heard, giving the feeling of sleeping out in the wild. Wildlife in Tuli includes Elephant, Kudu, Impala, Wildebeest, Giraffe, Lion, Zebra, Leopard, Waterbuck, Eland and Cheetah. Creatures that can be seen at night include Caracal, Aardwolf, Hyena and Jackal.